This exact outfit is all I'm interested in wearing at the moment. It's my mumiform, and the rest of my wardrobe may as well go on holiday. 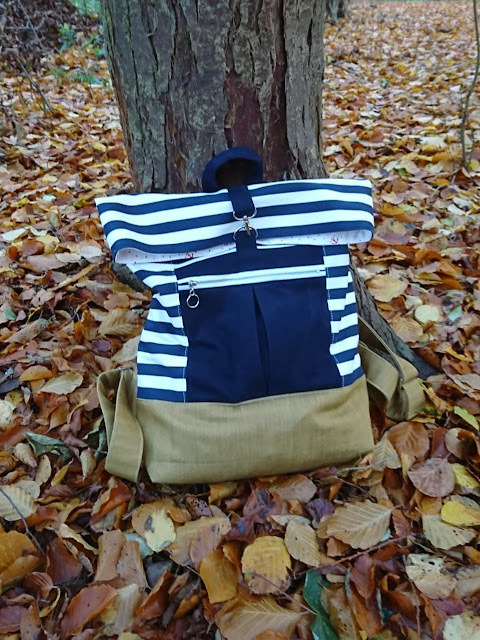 You've seen my stripy Gable top many times before, so let me introduce you to the new element. So it went down like this... Frankie and I are regulars at a playgroup that is also attended by this cool mama called Seonid (pronounced Shona). She made me aware of the overalls by Beaton Linen (pictured above and below) via Instagram after seeing me rock my Burnside bibs, thinking I'd appreciate them. She wasn't wrong, and I couldn't stop thinking about them. 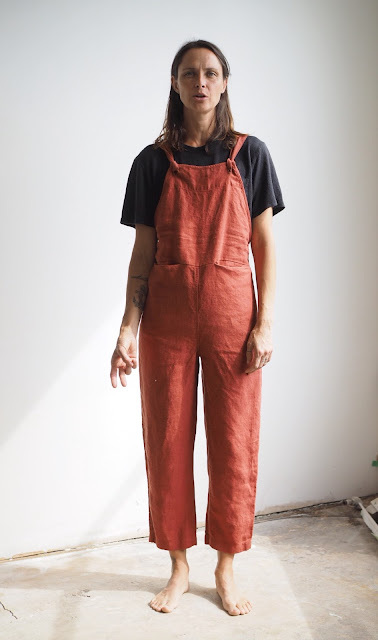 Shortly after discovering the Beaton Linen overalls, I received an email from the Made by Jack's Mum pattern company announcing the release of their new women's 'Heyday' dungarees pattern. They were even offering a 20% discount for the first week or so after it dropped. Despite the discount and their obvs similarity to my inspiration source, I hesitated for a couple of days. I feared that they'd make me look a bit too ceramics-evening-class-tutor. As I have discussed before, my style seems to be travelling towards Art Teacher chic, and I was concerned that this garment would seal that fate. But, ultimately, the pull of linen dungers was too strong and the purchase was made. The sizing range of this pattern is very generous, running from XXS to 5XL. The size chart put me as a Small which I wasn't entirely convinced about, so I added an additional 1cm to the side seams in case I wanted to adjust the fit (I wasn't making a toile). The seam allowance of this pattern is 1cm, which I enjoy sewing with, but wouldn't have left me enough wiggle room to take them out. I did end up giving myself slightly more room by letting them out at the side seams around the hip/bum area. Aside from adjusting the fit slightly for my booty, the only deviation I made from the pattern was to draft new front hip pockets. The pattern includes two pocket pattern pieces; one larger pocket for the bib, and four smaller pockets (two for the bum, two for the front hip). I wanted a slightly different look at the front, so I used the hip pocket piece I drafted for my black denim Cleo pinafore, but folded the bottom corner in to reflect the shape of the other pockets on the dungarees. Unlike with my Cleo, this time I remembered to apply some twill tape to the pocket opening so I can shove my hands in these ones as often as I like without fear that they'll stretch out. I fell in love with this linen twill from Fabric Godmother after sewing with and wearing it as my York pinafore. The weight, feel, movement and even how it fades slightly made it my number one choice this dungarees project, and I don't regret a thing. 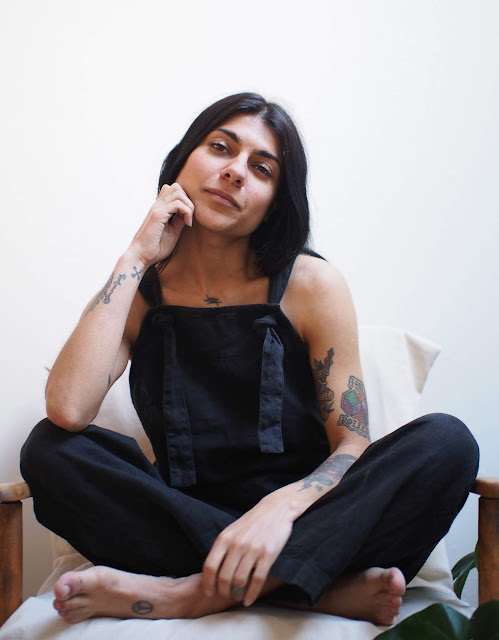 As I already said at the top of this post, I adore these dungarees. After the minor tweaking, I think the fit is bang on, and they are so comfortable that I don't even want to change out of them into some 'lounge wear' for relaxing in the evening, which I normally always do. I even think that I prefer them to the Beaton Linen ones, which look a bit too short and wide towards the bottom of the legs for my liking. Which is handy, because those Beaton ones are $270 a pop. I definitely plan to make another pair in a cotton/linen mix next spring. 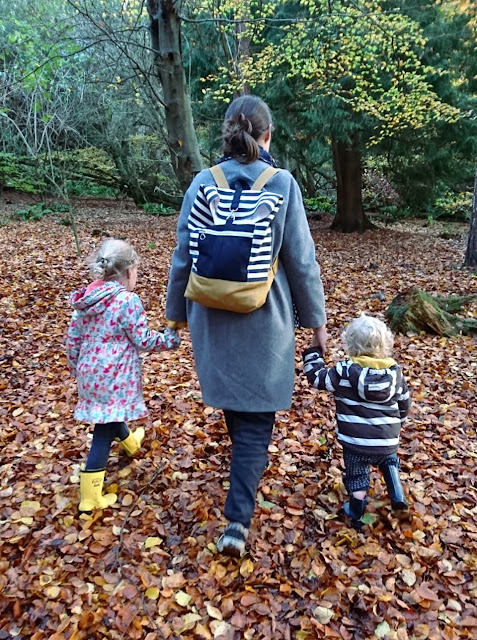 Welcome to my monthly 'Free Pattern Friday' feature, where I normally road test a free sewing pattern or tutorial: sometimes a children's one, sometimes a women's one. I publish these posts every first Friday of the month, timed to provide inspiration for those of you who plan to get their sew on over the weekend. I firmly believe that, if you pick your projects carefully, sewing doesn't have to be a crazy-expensive way to clothe yourself and your family. Thanks to all the amazing pattern designers who have offered up their hard work for us to enjoy for free. However, I'm going on a bit of a tangent with this month's instalment, so apologies if you swung by for a regular review of a free pattern (I flatter myself!). Today I want to write about sewing from a slightly different angle. With all the awesome new sewing patterns, beautiful fabric, labour-saving equipment and eye-wateringly expensive machinery available for sewers/sewists to buy, it's easy to buy into (sorry for the pun) the idea that sewing is like many other activities: a pass-time that will cost you a fair amount of money to participate in. But as skilled sewers, we are doing ourselves a disservice. We have forgotten, or perhaps more accurately, have allowed ourselves to be coaxed away from the belief that sewing is a superpower that can save money and resources, perhaps over time if not immediately. The point I'm trying to make is that the 'drop £15 on a lovely new sewing pattern, drop £20 on gorgeous fabric to make it in, sew it up then put it on Instagram' formula isn't the only way to engage in and utilise sewing. Don't get me wrong, as you can tell from this blog and from my own Instagram feed, I LOVE making a fabulous, well-fitting, wearable garment that helps me visually communicate to the world who I am and how I feel. But, increasingly, I am trying to make a conscious effort to do more of the type of sewing that the women from previous generations used to do: the mending, the reworking, the fulfilling needs in the home without necessarily spending money on new materials. 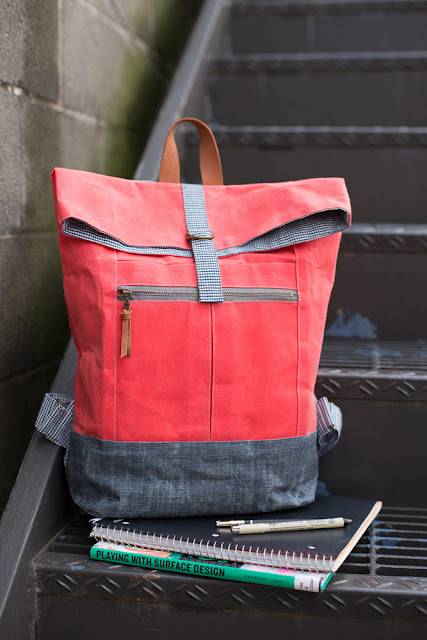 What I'm interested in thinking about at the moment is ways we can use our sewing skills to provide for ourselves and our families, as well as to have a positive environmental impact. And as anyone who has been sewing for more than five minutes will have realised, it's impossible not to accumulate a lot of stuff (fabric, patterns, zips, buttons, threads, blah blah). We already have a lot to work with. I think we need to encourage ourselves to flex our creativity more often to do more than just follow the steps of a sewing pattern, and work out how to turn some of what we have accumulated into some of the things we need in our daily lives (other than clothing). So how can we use our sewing skills to save money and resources? SO MANY WAYS. We have serious powers. We can mend ripped seams, replace missing buttons, knock up a fancy dress costume from an old net curtain, make the fabric totes and produce bags that we now take to the supermarket instead of accepting plastic bags, and infinitely more. Speaking of plastic. We (hopefully) all know now that not all plastic is recyclable. And recently we've been reading reports that the majority of plastic we think we're sending to be recycled isn't actually recycled anyway. I read a horrendous statistic recently (sorry can't remember the source) that said that people have produced more plastic in the last decade than we did in the WHOLE OF THE 20TH CENTURY, AND that only 9% of all plastic ever produced has been recycled. So like many people, I've been looking at my own waste: the amount and types of things my family sends to landfill or to be 'recycled', plastic very much included. I'm focusing on a few products that my family consume and then send to landfill at a time, and am trying to find and/or make alternatives that are more sustainable. All of which is a long-winded explanation and preamble to say that I've been making hankies. Yonks ago my husband and I got ourselves hooked on buying those multipacks of pocket tissues, with their layers upon layers of non-recyclable plastic. More recently I started buying boxes of tissues to have round the home to reduce the amount of plastic we were throwing away, but I felt that I could go one step better by making old-school, washable handkerchiefs. Now I'm hooked;, it's one of the quickest, cheapest and most satisfying sewing projects I've ever undertaken. It will not surprise you to learn that the process entails simply cutting and hemming a square of fabric, but whilst researching how big to cut my squares, I found this decent Wikihow tutorial if you feel you would like some guidance. The first batch I made was from some stripy cotton that lives in my stash and usually gets used for toiling/muslin-making. It has a similar weight and softness to bedsheets, and it's proven perfect for hankie making. The squares I cut were 30cm X 30cm, but I have found them to be slightly too small for an adult woman, so the next couple destined for my own use were 35cm-ish X 35cm-ish pre-hemming. 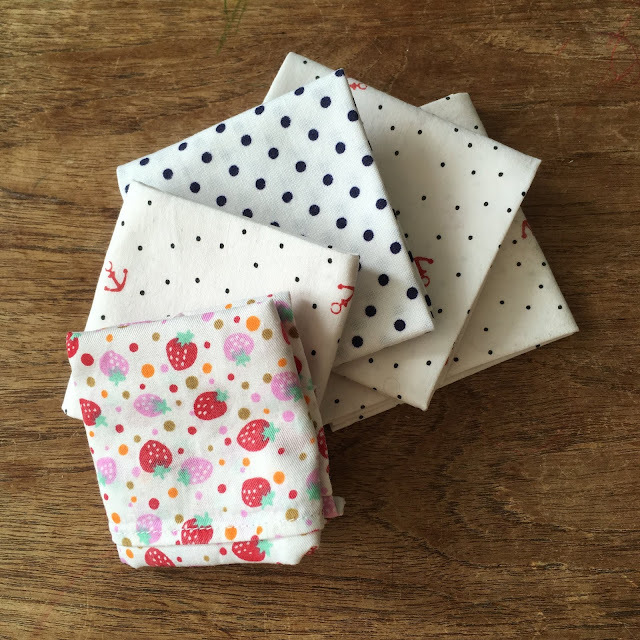 I must admit, having been used to using tissues myself for so long, it took me a while to get used to blowing my nose on fabric, but I've started to find it somewhat luxurious (particularly when I've bothered to iron and fold them into nice squares!). With my second batch (pictured above), I cast my net a little wider for candidates as I went through my fabric scraps tub. The anchor, spotty and strawberry fabrics are all slightly thicker than the stripy stuff. They aren't quite as nice to use, but are perfectly adequate and will probably soften through repeated laundering. I'd say the thickest weight fabric that is suitable for making handkerchiefs is a light quilting cotton type deal, and a soft bed sheet type affair is ideal. The strawberry fabric hankie is for my daughter, the smaller anchor and the spotty ones are for me, and I also made a couple of anchor hankies for my husband (40cm X 40cm). He has the worst sinuses of anyone I have ever met and gets through a shocking number of tissues per week. I'm hoping that I can convert him. Next I plan to try some scraps of cotton lawn. How lovely would a set of Liberty or Cobra corsage cotton lawn hankies be as a Christmas present? I think that would be super fancy. What about you? Are you a seasoned hankie-user? Or, like my best friend, can you just not get behind blowing your nose on fabric?! What have you made to replace a disposable/wasteful item you use in you're daily life?